The Prepared helps you get ready for emergencies without wasting time, money, or sanity. Get our free 1-2x a month newsletter. Just launched! Get our free newsletter and don't miss a beat. You are not prepared unless you make a habit of checking your prep supplies and plans at least once a year. Disaster can strike at any time. If your gear is expired, you can’t immediately find it, it’s scattered about, or you don’t remember how to use it, then you’re unprepared. Take at least a few hours, once a year, to touch and update your preps. You’ll be glad you did. Humans are creatures of habit, so treat updating your preps like a birthday or anniversary. The whole point is to make it easy, but solid. It’s important that you stick to it. Life will always try to get in the way — you have to make the decision that being prepared is more important than whatever trivial distraction might pop up. Some preppers use September 11th, July 4th, Memorial Day, and so on. If you’ve gone through a traumatic emergency before, like living through a car accident or home invasion, perhaps you can use that date since you’ll remember it anyway. And this exercise turns that negative experience into a positive one. Think about your local risks. If you live on the coast of southern Florida, we recommend doing your annual review in May, before hurricane season begins in June. If you live in Oklahoma, try February, before the tornado season starts in March. A core Sane Prepper Rule is that preps need to always be ready. Yet if we’re being honest, many of us fail to maintain that standard. Life gets in the way, things get scattered, you took the water bottle out of your bug out bag to go for a hike but forgot to put it back, and so on. Many people find a ton of value just from refreshing things in their memory: knowing what thing is where, which bag has which filter, that piece of the medical kit you wanted to buy last year but forgot to, and so on. Personally, we tear everything apart and lay it out. For most people, their core prep doesn’t involve all that much stuff — maybe a closet’s worth — so it’s easy to do on the living room floor. Test everything that is supposed to be functional, like flashlights and knives. Although it’s fine to skip testing the single-use road flares. Pay attention to anything that might expire. Batteries, medicine, food, etc. If you keep a written spreadsheet of your prep gear (which we recommend), try to label or organize things that expire. 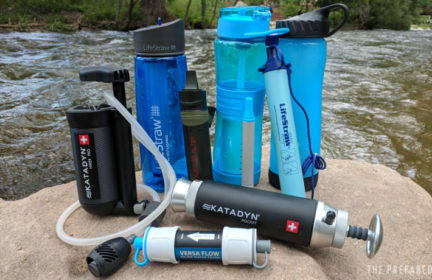 We recommend that Bug Out Bags and Get Home Bags have potable water already stored inside, typically in rigid water bottles. Water from utility grids is already chemically treated, so it’s fine to sit in the bottle inside your bag for a year. But this annual review is a good time to dump it out, clean the inside of the bottle, and refill. That way if you ever need to bug out, your bag always has at least some fresh, ready-to-drink water. Outside of any documentation specifically about your prep supplies, it’s a great idea to document the normal stuff you own. Documenting what’s around your home makes insurance claims, relief programs, or police reports drastically easier, faster, and more likely to be successful. It’s easy. Use your phone to record a video while you walk around your house. Narrate as you walk around. Point out valuable or important items. For example, point out your expensive TV and name the make, model, and size. Store this video in your private cloud (like Google Drive or Dropbox) or privately publish it to YouTube so only you can see it. Put any videos and records on a USB drive that you keep in your Bug Out Bag. Better yet, make multiple thumb drives and keep one in your safe, another in your Get Home Bag, etc. These videos, along with any written records like receipts or a spreadsheet of items like your firearm serial numbers, make a huge difference in whether any claims are approved and how quickly you get paid. Too many people buy a bunch of gear, never use it, and then have no idea how to benefit from it when they need it most. You should use everything you buy at least once. The annual review is a good time to practice, especially those diminishing skills that fade over time, like how to tie survival knots or how to use ham radio in an emergency. Once you’ve put your supplies back together, practice what an emergency would be like. For example, a bug out bag should be stored somewhere that’s easy and quick to get to. Like a closet near an exit door. If you were sitting on the couch watching TV, and suddenly had to leave your home in under a minute, could you? It never hurts to do even more serious or “real” practices. Try walking with your fully-loaded bug out bag on a few-mile hike. Or park your car a mile away from home and walk the rest with your get home bag, stopping to think along the way how you would do things like get water or apply a tourniquet. You don’t have to spend lots of time or do extreme things. Usually the lightbulb moments, like “oh yeah, I totally didn’t think about ___!”, happen after a small amount of 80-20 work. Prepping isn’t just for EMPs and fascist zombies, it’s for the normal stuff that happens to everyone. Like death, divorce, taxes, medical problems, and car accidents. Even if there haven’t been big changes to your wishes (like giving your son-in-law only $1 in your will), making sure contact information is up to date for yourself and any beneficiaries will save a lot of hassle down the road. If you died tomorrow, would your loved ones be able to easily understand the landscape of all the important “life stuff” they need to address? Or are you creating more work, pain, and expense for yourself or your family by creating months (or even years) of work to figure it all out? This can be a great time to prepare for digital risks, too. Even if you keep most of your day-to-day files in the cloud (Google Drive, iCloud, Dropbox. OneDrive), many people chose to make a local backup on an external USB hard drive. A full 1TB external USB hard drive with 256-bit encryption for under $60. Includes software that's helpful for the computer-challenged. A Prepared Pick. Extremely tough construction and 256-bit military encryption. Attached USB cord. No bloatware or junky software needed. Take it a step further and get a hard drive with built-in encryption. The only way to get access is with your password — not even a government brute-force attack will work. Speaking of passwords, take the time to update your most important passwords, like those to your primary email and bank account. We recommend using LastPass to manage all of your passwords. The Prepared helps you get ready for emergencies without wasting time, money, or sanity. We obsess over the details and work with experts to create well-researched, well-tested recommendations that are simple and practical. Learn more about what we do and how you can support our work for free. Get emails with new posts and 0% spam. We’re proud to donate 1% of our revenue for environmental protection around the world. All material on The Prepared is copyrighted. You may not commercially benefit from our hard work without permission.